True, kettlebells are all the rage. But let's be honest here. Those babies can hurt! You do a basic clean and press and the weight smacks against your forearm and wrist—ouch! But never fear. Bob Harper (the super-cute trainer from The Biggest Loser) is out to change all that with his new Contour Kettlebell. At first glance, the weight looks a bit like a loaf of bread that someone squished in the middle (and slapped a handle on). Here's the cool thing: That concavity makes for a softer landing when the kettlebell comes in contact with your body. 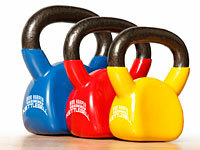 So sure, you're still being clunked by a heavy weight, but it's much less jarring than with a traditional kettlebell. But the real treasure here (for newbies, anyway) is the excellent introductory 30-minute workout DVD that comes with the kettlebell. Harper is a precise, attentive teacher with a friendly manner. He gives good (and frequent) form tips, never leaving you in doubt about what you should be doing—so helpful (and crucial!) when you're trying to swing a heavy weight around without injuring yourself (or smacking a gaping hole in the television). Like all good teachers, he also explains the "why" behind what you're doing, revealing, for example, that using a heavier weight is actually good, because it anchors you and keeps your body aligned. There's just one glitch. In most fitness DVDs, whoever's demonstrating the exercises allows you to mirror her movements, by moving her own body to the left when she tells you to move right, for example. Not so here. When Harper says to move right, the woman demonstrating the exercises moves right as well, so you end up heading in the opposite directions. It's a bit confusing—especially for beginners. Still, this is the best introduction to the kettlebell that I've seen. Also, the innovative shape of the kettlebell makes the weight itself much more pleasant to use, no matter how experienced you are. Time to get swinging! Pros: It's more comfortable to use than traditional kettlebells, and the DVD is an excellent introduction—with a top-notch instructor—for folks unfamiliar with the equipment. Cons: Some exercises are visually hard to follow. Extra tip: If possible, test the different weights in-store at Target before you buy. Otherwise, go to any sporting-goods store, try out a regular kettlebell to find the best weight, then order the Contour online.